Forex Cards are prepaid foreign currency cards used for making payment when you are traveling abroad. Be it a family vacation or business trip, traveling abroad is a fun! Well, you need money for spending while traveling abroad. If you don’t want to take a headache of handling a cash and exchanging currency while traveling, forex card is the best option for you. There are number of forex cards available in the market. Selecting a best forex cards among them is a task. 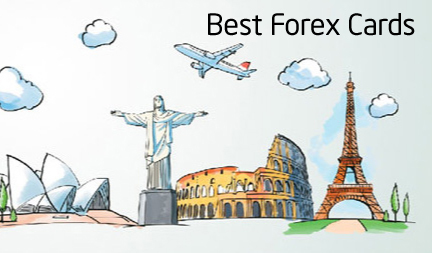 In order to help you, I am here with features and comparison of Best Forex Cards in India. Forex Cards are prepaid ready to use cards in a regional currency. This card is available with fix amount. You can top up this card based your requirement. This card also allows you to withdraw cash in a foreign currency. Prepaid Card, Travel Credit Card, Prepaid Travel Money Card are other names of Forex Card. Why Forex Card is better compared to Credit Card? Forex card is cost effective compared to a credit card. In credit cards, you need to pay a service charge of 3-6% for usage. In addition to that, you need to pay a flat fee for withdrawals at ATM. Any delay in bill payment of credit card will attract a penalty. In forex card, you need not to pay any service charge. ATM cash withdrawal fee is less in forex card. In addition to that, you can avoid currency conversion charges as cards are available in major currencies. It also allows you to use Top-up facility. IndusInd Multi Currency Forex Card is also known as Indus Multicurrency card. It is best forex card available in the market as of now. Ease of getting card and low charges are plus points of this card. Let’s look at features and benefits of this card. Hassle free faster online process. You will get delivery of this card within 24 hours. Facility to track balance of card through online website. Secure cash withdrawal via ATM. Zero currency conversion charges and zero ATM withdrawal fee. Very low card issuance fee. IndusInd Multi Currency Forex Card support eight different currencies including USD, Euro, AUD, GBP, SGD, AED, CAD and SAR. This forex card claims that they do not charge any cross currency conversion fee. However, GST is applicable on currency conversion. This card provides complimentary Airport Lounge access. You can use this card online at e-commerce platforms. HDFC Regalia Forex Plus Card offers cashback of 5% or 5x Reward point offer. Emergency Cash delivery at overseas location. HDFC Regalia ForexPlus card support wide range of currencies like AUD, AED, CAD, CHF, Euro, GBP, SGD, SEK, and USD. However, for simplicity you can load only one currency USD. Thomas Cook Borderless Multi Currency Prepaid card is marketed as one card supporting 8 different currencies. This card is globally accepted at 35.2 million merchant establishments. Let’s take a look at benefit and features of this card. Load up to eight currencies in a single card. Access to wide range of merchant establishment and ATMs. Customer portal to check balance and statement. Dedicated customer support and emergency service. Thomas Prepaid card supports eight currency USD, Euro, AUD, Swiss Franc, GBP, Yen, CAD and SGD. Axis Bank Multi Currency Forex Card is a unique card supporting 16 different currencies. It is forex card exclusively designed for the people traveling extensively. Feature and benefit detail of this card is given below. Single Card supporting up to 16 different currencies. Emergency assistance with emergency cash delivery facility. Insurance coverage up to Rs.3 Lakh for lost and stolen card. Encash your refunds once you return. Validity up to 5 Years. 16 Currencies supported by Axis Bank Multi Currency Forex Card are USD, EUR, GBP, SGD, AUD, CAD, JPY, CHF, SEK, THB, AED, SAR, HKD, NZD, DKK and ZAR. How to Apply for Forex Cards? Confirmed Ticket with Travel within 60 days. On verification of documents, you will be asked to make payment. Once this process is completed you will receive a card from the bank. Some bank may ask additional document along with the application. Word of caution: PLEASE AVOID INDUSIND FOREX CARD.. POOR EXECUTION PATHETIC CUSTOMER SERVICE. THEY JUST DONT CARE !! MY SERIOUS RECOMMENDATION STAY AWAY FROM INDUSIND FOREX.